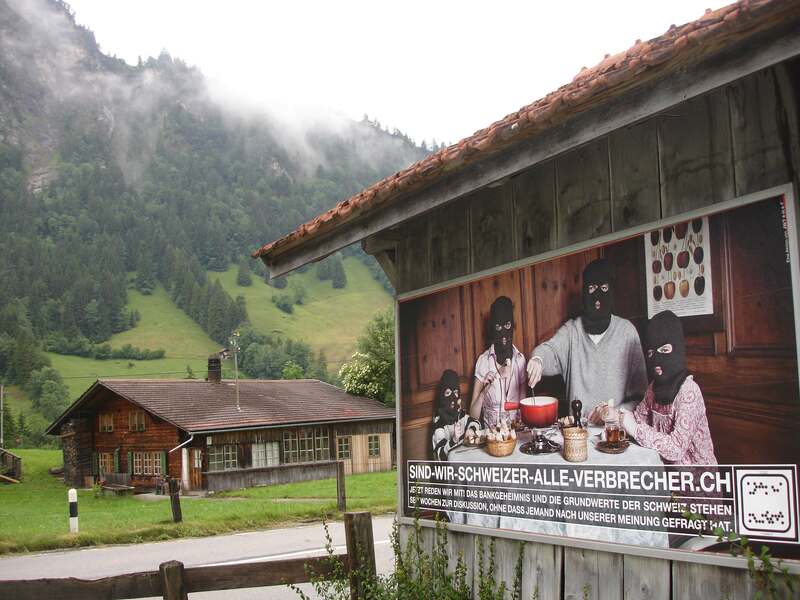 “Are we Swiss all criminals?” The poster asks. No. But many Swiss bankers are. We have written recently about how Credit Suisse’s $2.6 billion fine for its history of abusing the U.S. tax system and facilitating high crimes may seem like a lot of money, but it could — and should — have been a lot worse. Why did no bankers go to jail? And, perhaps more importantly, why does it still have its U.S. banking licence? In other words, U.S. taxpayers won’t be sticking with the bill, but CS may well foist it on ordinary Swiss citizens instead. Let’s see what happens: the outcome is currently uncertain. If it ends up being tax-deductible, one may conclude that this is poetic justice of a kind, given Switzerland’s role as a large, mucky tax haven. And it will doubtless infuriate many ordinary Swiss people, being stuck with part of the bill for all this criminality: this will doubtless provoke debate and reflection in Swiss society, which is much needed. If truth be told, we don’t have a beef with ordinary Swiss taxpayers: it’s the jurisdiction and its tax and secrecy laws that bother us. And besides, the United States is hardly one to talk about being a tax haven.